When I am traveling or vacationing with family visiting new places, one thing we love to explore is the food culture of the place. You probably get to know it even better with their food culture. If you follow me or read my last post, you read about lake placid. This post is all about lake placid's food culture. Probably one post or one trip is not enough for exploring. Lake placid food is even better because you get to eat with a privilege of a lake view. Most restaurants in lake placid area are by the mirror lake. The first day when we reached lake placid, it was already evening. After strolling for a bit we went for early dinner in the Cottage by the lake mirror. This restaurant is part of mirror lake inn. The cottage is more popular for lunch. We couldn't resist, at a first glance, after seeing The cottage at the heart of mirror lake. You get to see the best view of mirror lake from the cottage. Cozy, offbeat with American fair, live music and raining outside, full packed yet attentive service. As in vacation, I love to indulge in few things which I don't eat or order in my regular restaurant visits. 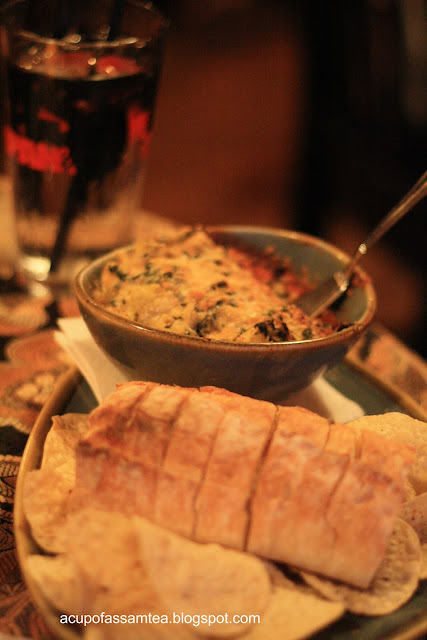 While going through the menu, I was tempted to order spinach artichoke dip that was my pending wish list for a long time. When it comes to food, looks and presentation also play a vital part. Ah, same applies to our artichoke spinach dip too. Already it increased my appetite by its look itself. Opulent at the same time melting in the mouth, Arithock dip and pita and corn chips you just can't miss it, except those extra calories. Then came jalapeno and black bean hummus. This is definitely a little innovative hummus with a twist. 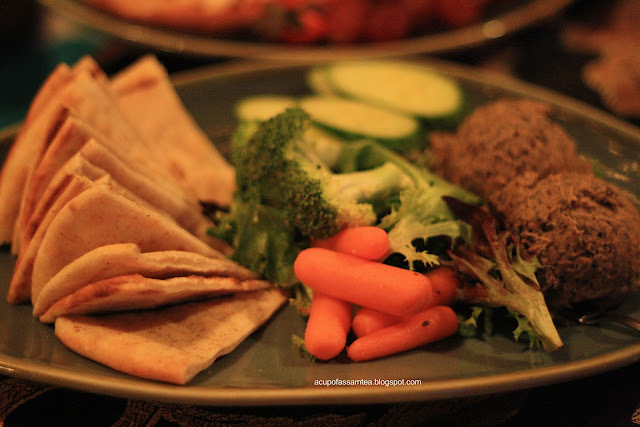 A hint of jalapeno makes it even palatable pair with perfect pita and hearty healthy crisp veggies. 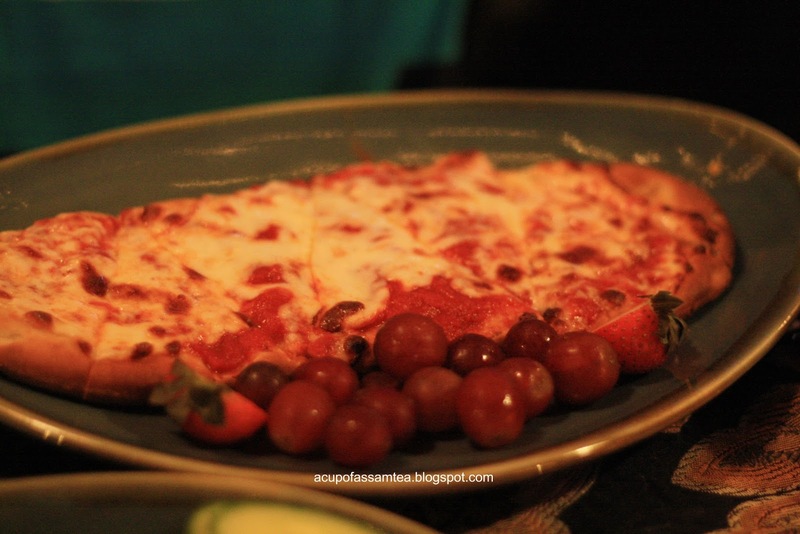 Then came the main, for the kids their favorite macaronni cheese and cheese pizza, the best part was that it was also served with seasonal fresh fruits. 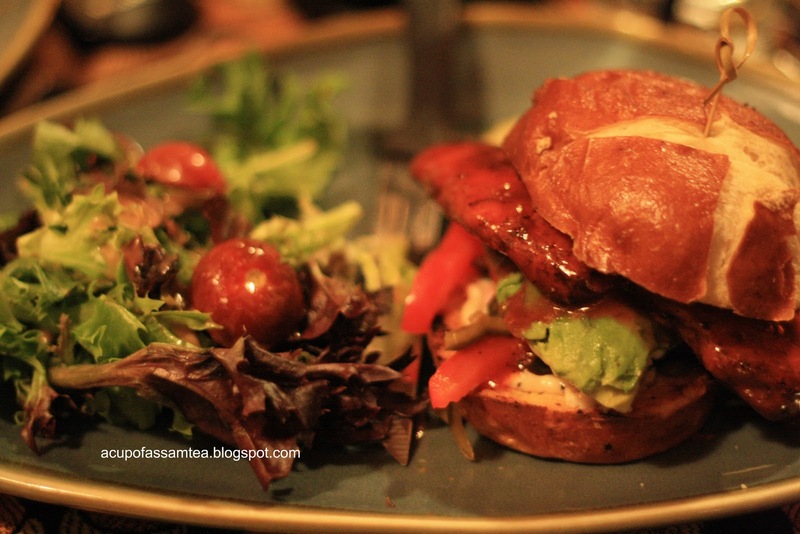 For us adults, black bean burger. As I have special affination for bean burgers, I might be a little partial. It was luscious and moist without being dry, as bean burgers, most of the time it tends to get dry and love the way it pairs with red pepper, aioli, and pretzel bread. My husband got honey sriracha grilled chicken as the name already raises some high hopes. It was not as expected, I mean we expected little more innovative than a regular chicken burger. We can't stretch on including veg in our daily diet. 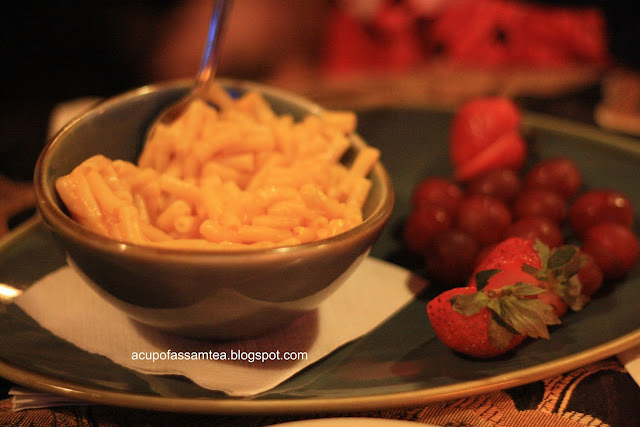 It was definitely a raving part, like the way The cottage includes seasonal fruits and veggies in almost every entry. This time we were already over full, so didn't opt for dessert, probably in our next visit. Yes Kitty we had a great . Thank you so much ! The kind of food in a certain place we visit is a great factor that we can remember after such visit. We will certainly recommend a place if the food is good along with the warm accommodation. It's good to know that you enjoyed your vacation. How true Sharon. Thank you so much ! I love my food and this is definitely something I must try as soon a possible! Not a big fan of bean burgers but the rest sound extremely delicious! Hopefully it is not too expensive? How sweet of you remembering your daughter in law. Thank you ! I hope that you are having a great vacation. I've never heard of a bean burger before. Maybe we call them veggie burgers here? Laura it is quite new I suppose. I did not hear about it couple of years back too. Food is definitely one of the best parts of traveling. So true ! Thank you . mmmm... I love food AND travel so this is awesome. I'm not familiar with Lake Placid. Will have to check it out. Sounds like such a perfect romantic setting with the rain, live music and view of the lake. Pics of the food look delish! I've got some friends in the states that have mentioned visiting Lake Placid- I may have to tip them off- as they're veggies, too! Great work! When I think of lake placid, I almost always think of the movie. But that burger, that might make a girl forget about any sort of movie! I;m only familiar with Lake Placid by the movie by the same name. I believe it was about a giant crocodile or so. I must say, the food at the cottage looks delish. Looks like a must-visit! Yes Kimberly. Thank you ! Glad to know that Milton. Thank you ! Seems you had great time.Yes,I also love to explore and experience food culture when we travel.. 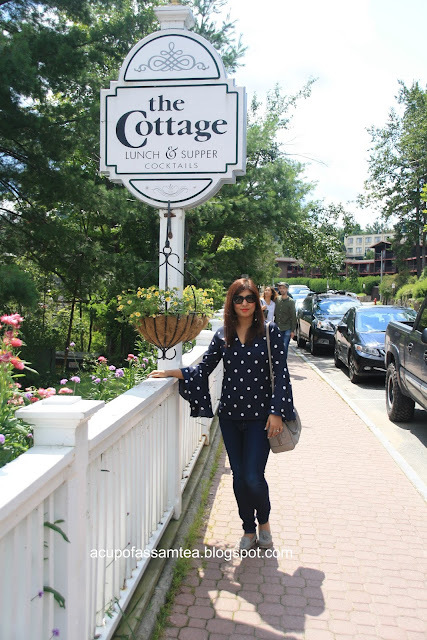 The cottage does look like it has some amazing food experiences with which to explore. I would love to check it out when I am in the area. Sure David. Thank you ! Always good to experience the culture, food and tradition of different people. How true Gideon. Thank you ! This sounds like an interesting place to eat for sure. I would love to try a bean burger and the honey sriracha grilled chicken. The bean burger sounds more interesting thought than the chicken one. Thanks for sharing your experiences. Yes Rebecca. Thank you ! Wow that looks really good! Thank you for sharing a glimpse of your experience to that awesome place. Mmmm. I love a good excuse to indulge while on vacation. I would be all about that burger especially! Lake view eating has got to be absolutely breath taking and beautiful. Looks like you had a full and good meal there. Yum! Absolutely Rain. Thank you ! Yes Nazy. Thank you !